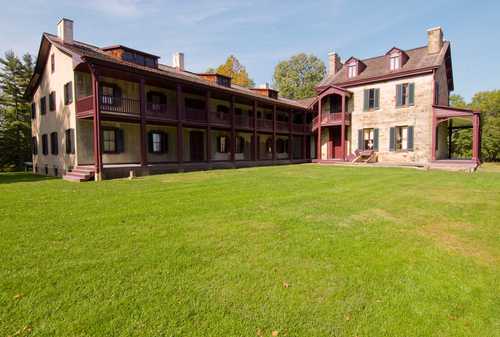 When you plan your next RV trip, include the Friendship Hill National Historic Site in your trip. While it takes about 1 to 1.5 hours to take the tour through the house and view the “Reflections of Gallatin” presentation, you still have 661 acres of park and trails to explore. No matter the season, make sure Fretz RV services your RV before you head out, unless you’ve just had it serviced. And, if you are considering a new RV purchase, you can take a trip to the Friendship Hill National Historic Site as a test trip in your new RV. The Gallatin House Visitor Center is open from 9:00 a.m. until 5:00 p.m. from May through September. In October, the visitor center is open from Friday through Monday and is closed on Tuesday, Wednesday and Thursday. From November through March, the Gallatin House is open on Saturdays and Sundays, unless a federal holiday – Veterans Day, Christmas and New Years – fall on Saturday or Sunday, in which case, the Gallatin House will be closed. In April, the Gallatin House is open Friday through Monday. The park grounds and the trails are open from sunrise to sunset throughout the year. Since Albert Gallatin was in the United States since 1780, he was still removed from the U.S. Senate in 1793 because he did not swear an oath of allegiance until 1985. A senate vote along party lines disqualified him from sitting on the senate. Gallatin served as Secretary of Treasury for almost 13 years. The only person to have served in the cabinet longer was Secretary of the Interior Harold L. Ickes, who served from 1933 until 1946. Gallatin served during the Jefferson and Madison administrations; and the Gallatin House preserves his country estate. During Gallatin’s time in office, he purchased the Louisiana Territory, reduced the national debt and funded the Lewis & Clark exploration. Friendship Hill has been restored so that we can visit that piece of history. Before you head out, stop by Fretz RV to have your RV serviced if it’s been some time since you last had it serviced. If you are considering purchasing an RV and think weekend trips and even an extended trip might be fun, stop by Fretz RV to pick out your new RV.